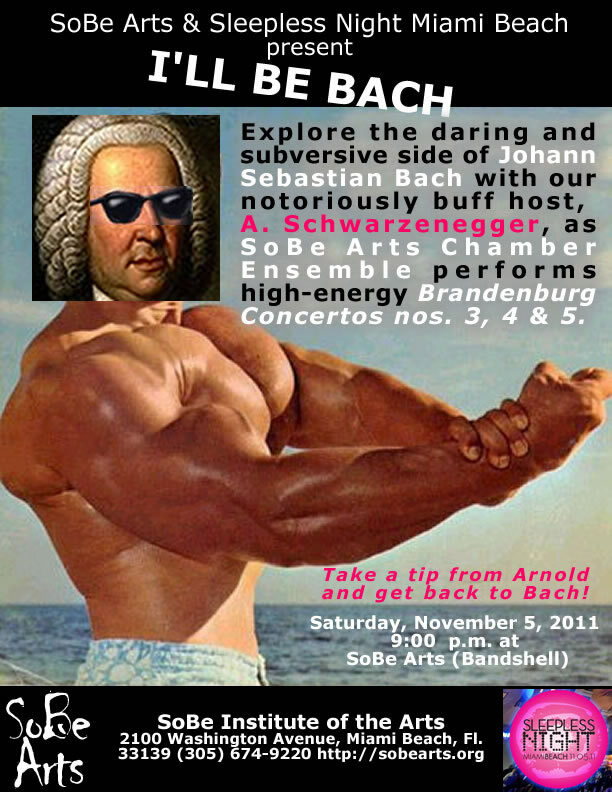 Explore the daring and subversive side of Johann Sebastian Bach with our notoriously buff host, A. Schwarzenegger, as the SoBe Arts Chamber Ensemble performs high-energy Brandenburg Concertos. In 1721, Bach presented the Margrave of Brandenburg with a bound manuscript containing six pumped-up compositions for chamber orchestra. The Margrave never thanked Bach for his work or paid him, but the Brandenburg Concertos still blow away the competition almost three centuries later! Unlike our host, Bachâ€™s poundage still packs power! â€¢ The program lifts off with concerto #3, familiar to us from its use in Clockwork Orange and Die Hard. â€¢ The harpsichord cadenza in the first movement of concerto #5 sounds like some crazy improvisation from a rock band. This part, first performed by Bach himself, was heard on The American President, episodes of The X-Files and still dazzles audiences with its virtuosity and precision. â€¢ Lastly you will hear Wachet auf, ruft uns die Stimme, Cantata No. 140, also known as SLEEPERS AWAKE! This Cantata, used in Mr Holland’s Opus, arranged for strings and harpsichord contains such joy and sheer beauty it must be heard to be believed.